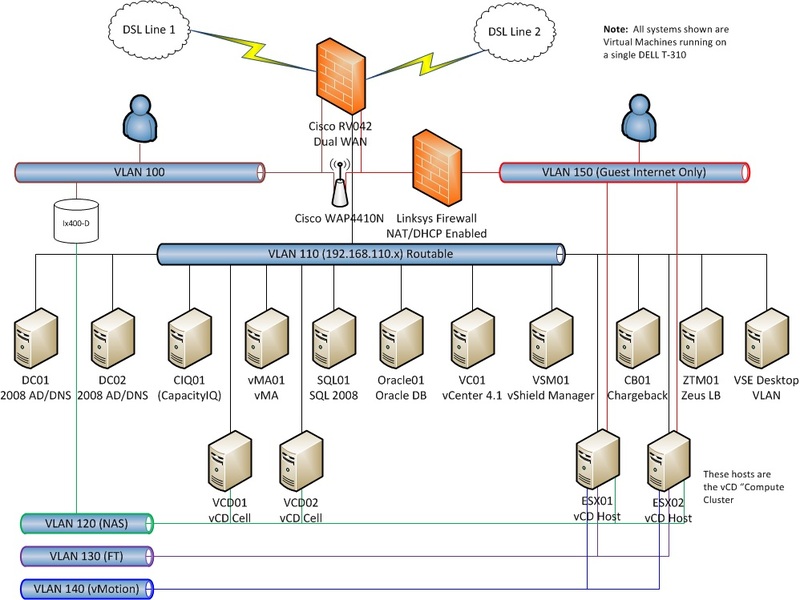 This outlines the configuration I personally used for installing setting up a lab based “vCloud in a box” for testing and understanding of all the vCloud components. This setup can be done almost 100% virtually with a single physical server hosting all the components. Parts of the configuration are unsupported by VMware for production as well as on certain platforms, however almost all of it works for training and testing purposes with limited hardware. Although this can be done on other platforms the storage and servers used here were IOMEGA and DELL. The Switch was Netgear GS742TR routing switche although many others at least support VLAN tagging just not routing functions. I assume the reader has knowledge and expertise already with setting up switches, VLANs, routing, as well as vSphere. If you do not require full routing functions portions of this can be changed as needed. The components and configurations listed here are what I used to build my implementation, but you can use some of the information to adapt to your needs. I will have to assume knowledge exists to create the VLAN’s, setup routing as well as other network items. If that needs to be detailed I can always update this post later. Very nice write-up. I’ll be doing something very similar soon and this will come in quite handy for sure. i’m going to buy some equipment to build my home lab.. I’m looking at motherboards that have dual socket should i spend the extra bucks for the second processor? My work loads will be vCloud director, Capacity IQ, SQL, ORACLE, vmware view and file server(and some VDI machines for the wife and kid). I also want to use this setup to demo products ad hoc for customer… thoughts?